Sport climbing harness Flash by CAMP, lightweight and comfortable. A mere 235 gr light, this is designed for sport climbing at the highest level. 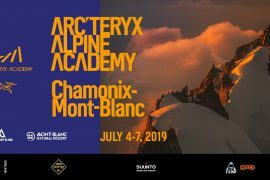 An entirely new sport climbing harness concept designed for sport climbing at the highest level. The hyperlight Flash features innovative Load Webbing construction with structural longitudinal threads that allow for a wider cross section for greater support without the added weight of traditional webbing. The construction allows for a significant reduction in the number of stitch points to minimize the profile and maximize comfort and safety. With the Flash, we have also integrated 3 mm of padding adhered directly to the webbing for increased comfort. 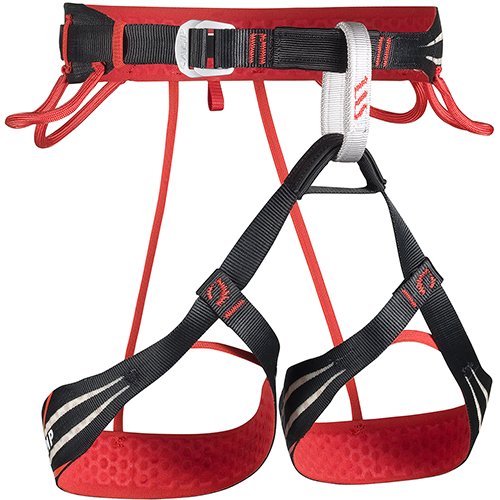 The gear loops are designed for optimal performance on challenging sport routes with the front loops ergonomically molded for fast access to quickdraws. The rear loops are softer and lay flat. 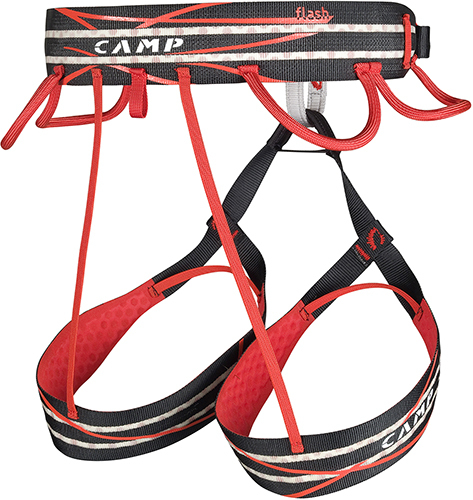 Sport climbing harness Flash by CAMP, with 4 gear loops.